Aleks-Daniel Jakimenko-Aleksejev, the release manager of Perl 6, decided that it didn’t make any sense to create a 2019.01 release of Rakudo Perl 6, as there were still a few blockers that probably still needs some days of quality attention. So the next release (2019.02) will tentatively be on the 16th of February. Apologies to all who expected to get their hands on a stable Rakudo Compiler release earlier. This Saturday (anywhere in the world) will see yet another Squashathon, this time focused on fixing problems with modules in the ecosystem. 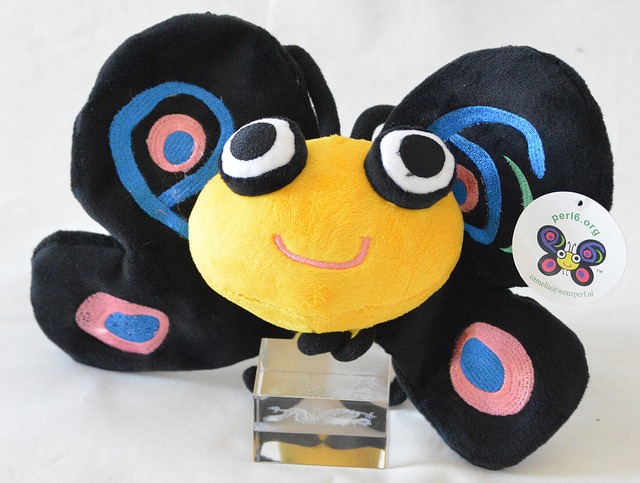 As usual, the winner will win a nice plushy Camelia! So please join in, all the little bits help, cause we’ll all be winning from your participation. Andrew Shitov gave a presentation at FOSDEM about how you can use Perl 6 as a tool for writing compilers (video on Youtube, comments on Reddit, Facebook). Really cool to see how little you need to do in Perl 6 to create a barebones compiler / executor. Will Braswell also gave a presentation at FOSDEM. This one was about the state of the Perl universe with all of its former, current and future projects under the Perl 11 umbrella. (FOSDEM video). Lee Johnson tells us there is going to be a Swiss Perl Workshop in 2019, coming back to the nice town of Olten. But the dates are not set yet. In fact, there are 3 possible dates. And he would like you to take a poll so a decision can be made in early March. The slides of “24 uses for Perl 6”, a presentation given by Simon Proctor at the last London Perl Workshop, gained some attention on Reddit this week. Raji Ayinla describes how to hire a Perl developer, with some side notes about Perl 6 (Reddit comments). Dmitri would like to see Perl to be one of the first to support QUIC, QPACK and HTTP/3. I guess that if it would be Perl 6, then that would also be good. Alexey Melezhik announced that SparrowHub will now be frozen for Perl 5 Sparrow client usage (Reddit comments). Aleks-Daniel Jakimenko-Aleksejev tells us that due to personal circumstances beyond his control, it will become very hard for him to perform any release manager duties. So a new release manager will be needed in the foreseeable future. If you have time and passion for Perl 6, please let us know on IRC #perl6 (on freenode). String Concatenation Hangs by con. How to prevent the perl compiler from changing the name of dynamic link library by lovetomato. Simplify the invocation of a common method by lovetomato. When should I use roles instead of classes? by ogniloud. Equivalent of store or use Storable by con. Last element of a block thrown in sink context by JJ Merelo. Cumulative Z op throws a The iterator of this Seq is already in use/consumed by another Seq by JJ Merelo. Mix syntax for Boolean elements by JJ Merelo. Cannot import module using Inline::Perl5 by con. Dealing with invalid filehandles (and maybe other invalid objects too) by JJ Merelo. It is possible to use a grammar on raster data? (Use Case : Cloud Optimized GeoTIFF Validation) by notagoodidea. Get a symbol’s value by its name in a sub by lovetomato. Defined vs. exists with hash keys by con. Memory leak in concurrent program, or just the way it is? by JJ Merelo. Cannot unbox 65536 bit wide bigint into native integer by Sno. How to mitigate a bug in Rakudo with NativeCall? by Kaiepi. How to load Perl 5’s Data::Printer? by con. Installing Linenoise on CentOS: cannot find library “luv” by con. Camelia Cookies! by Wendy van Dijk. Weekly delayed by Wendy van Dijk. A treasure to get used to by Alexander Kiryuhin. Other ways to optimize by Alexander Kiryuhin. More options bad? by Leon Timmermans. The only programming languages by Ralph Mellor. Use most Perl 5 modules by Ralph Mellor. Where to start? by 🔥那由多 🔥. Acquisition in Perl 6 by ryn1x. Could be learning Perl 6 by aoeupl phe. No normal webframeworks? by Neuromantic-JS. Nice to see LZW by Extirpator. Not so with Perl 6 by Karl D. Asmussen. Prize arrived! by olive garden speedrun champion 2019. What is named and what is not by Timo Paulssen. Not even by Dave Anderson. Not Perl by Fred Moyer. Unreal grammars by default mode natework. Inline::Go barebones by Brad Gilbert. More gradual typing by JJ Merelo. Can not get it by 響音カゲ@にゃん. Grammars might have done well by Daniel Rosenwasser. It became easy by kamimura. Seems to be different by お試し君. A second hand Cortina by Simon Proctor. Lovely comments by JJ Merelo. BGP linter by Joelle Maslak. Right by your side by JJ Merelo. Towards 1K by JJ Merelo. Builtin parallelization by Humberto Massa. Raster Data? by Ed_0110100001101001 💡 ⚙️ 🛠 ☕️. Why as Perl 5 by Kaoru NAGASHIMA. Mu as a type? by sholto maud. Not skipping again by JJ Merelo. More exciting by Marek 🇫🇮 🎃 🇪🇺. See you next year! by Patrick Spek. Not a trainwreck? by firebreathingduck. Seems to be old by %20｜1751 (+35). And the kitchen sink by Ricardo Bittencourt. Only sticker by Sebastian Gfeller. Equivalent of Perl 6? by Kevin Pilch. Anyone using Perl 6? by Michael Graziano. Free ebooks by 1 eBooks. Perl 6 and Cro by JJ Merelo. What did you think of it? by rosstimson@bsd.network. Crazy stuff by Fernando Rodríguez. Perl 6 by Simon Proctor. What killed Perl by Augie De Blieck Jr.. Stealing multiple dispatch? by isomorphismes. trans is Cool by chee (ª). Wanders off again by Simon Proctor. Just saying by Simon Proctor. Un sondage pour décider by Monguers de Perl. Past week highlights by The Perl Shop. ROFL by Hartog de Mik. Suddenly inclined to learn Perl 6 by Ian Bertolacci. Two in One by Николай Говоров. Roles are fundamentally broken? by Vadim Belman. Binary test and position? by ToddAndMargo. How do I use chr inside a regex? by ToddAndMargo. Start reading at a specific index? by ToddAndMargo. Faster than index? by ToddAndMargo. Fastest way to convert from a Buf to a Str? by ToddAndMargo. “index” source code? by ToddAndMargo. Reassigning values to variables question by ToddAndMargo. split and Nils? by ToddAndMargo. Dislike Perl 6 very much by hzhou321. On Stack Replacement by Ralph Mellor. On gradual typing by amyjess. A runtime that can change itself by Ralph Mellor. User definable OO by Ralph Mellor. 4 minute version by Ralph Mellor. XML::Class, Tinky, Audio::Hydrogen, Lumberjack::Application, IO::Path::Mode, CheckSocket, Audio::Liquidsoap, Device::Velleman::K8055 by Jonathan Stowe. Getopt::Long, App::Prove6, Path::Finder by Leon Timmermans. FOSDEM was a really nice event (apart from the weather on Saturday). But the final kick of FOSDEM didn’t reveal itself until after getting home again. Meeting about 1500 people at the Perl booth, was both enjoyable but also very tiring. Literally running out of Tuits. But it appears that at least one of them also gave yours truly a pesky virus that basically incapacitated her for Monday and most of Tuesday. So the Perl 6 Weekly got a bit delayed. Hope it will be found enjoyable nonetheless! Since most development efforts were focused on fixing blockers, and this Perl 6 Weekly is already late, I will get back on the core developments of the past week in the next issue of the Perl 6 Weekly. So see you then! ← 2019.04 Summer of Code!